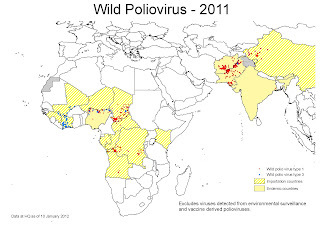 The last case of polio in India occurred exactly one year ago, on January 13, 2011. In the decades-long battle against this devastating disease, this is one of the best pieces of news in a long time. Just two years ago, health officials counted 741 polio infections in India, and it seemed that the battle was far from over. It may yet be, but in 2010 the cases dropped dramatically, to just 42, and last year there was only one, on January 13. As recently as the 1950s, polio was a dreaded, incurable disease that killed or paralyzed millions of children each year. The U.S. alone had 58,000 cases in 1952. Then came the invention of a vaccine by Jonas Salk, one of the great medical breakthroughs of the 20th century. By the 1960s, widespread vaccination campaigns had virtually eliminated polio from Europe and the U.S. Polio lingered in the U.S., mainly in the Amish population who refused to accept vaccinations, but it finally disappeared in 1979. The worldwide campaign to eliminate polio started in 1988, when 350,000 infections were recorded. Polio is extremely difficult to control, because a large majority of infected people show no symptoms, but they can still spread the virus. Vaccination campaigns need to treat everyone who comes in contact with an infected individual in order to break the cycle of transmission. This is especially hard to do in remote areas of poor countries, especially when the populace is suspicious and uncooperative. "Rumors spread among the region's numerous Muslims that the polio vaccination campaign was an American conspiracy to wipe them out, by making their sons impotent and their daughters infertile.... Vaccinators were stoned as they approached Muslim neighborhoods. 'The general mind-set was that the immunization campaign was aimed at ending our lineage,' said Anwar Ahmad, the head of a madrassa in a Muslim neighborhood in the city of Meerut." The campaign turned around after UNICEF and Rotary international launched a major education effort that first convinced Muslim leaders, and then everyone else, that the vaccine would benefit their communities. With this success in India, polio is now endemic in only three countries in the world: Afghanistan, Pakistan, and Nigeria. The same rumors and conspiracy theories that plagued India have spread within Muslim populations in these countries as well, but India shows that the misinformation - and polio - can be defeated. Unfortunately, even here in the U.S. we have our own conspiracy theorists: the anti-vaccination zealots over at Age of Autism, where Dan Olmsted and Mark Blaxill recently posted a series of articles claiming that polio is "a harmless intestinal bug" that only causes disease when triggered by pesticides or by arsenic. Never mind that there is no evidence to back this truly wacky assertion; these two anti-vaxxers seem happy to invent facts to support their single-minded campaign against all vaccines, even when the vaccines are demonstrably saving tens of thousands of lives. Polio is still with us, and it could return. Besides the 3 countries with endemic polio, 9 other countries continue to suffer polio cases that were imported from endemic countries. 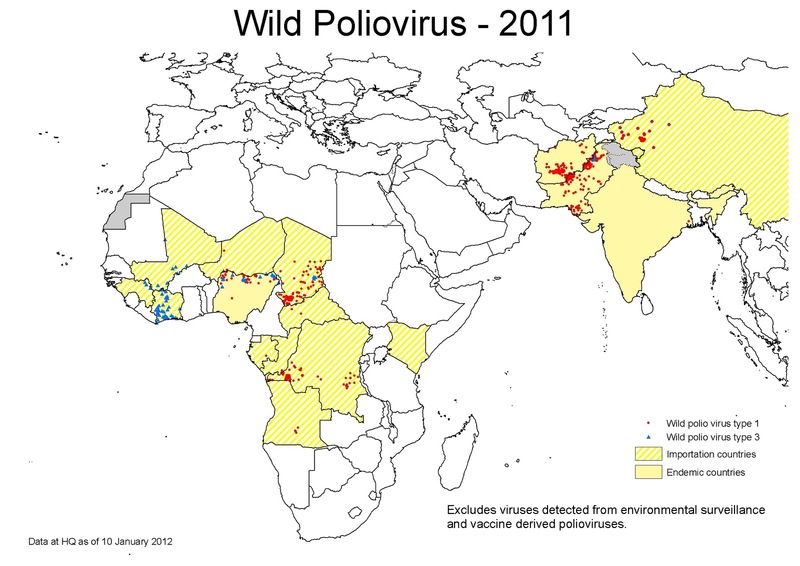 Without widespread vaccination in those countries, polio could re-establish itself in any of them. If polio stays out of India, we can thank the thousands of health care workers who traveled to remote villages, in extremely difficult conditions, to dispense lifesaving vaccines. Their heroic efforts have paid off for everyone. We should also thank the combined efforts of the WHO, UNICEF, Rotary International, the Gates Foundation, and the CDC, all of whom are backing the worldwide effort to eradicate polio. Let's root for humanity to win this one. I saw a documentary on this (vaccination difficulties in India and the work of the Gates Foundation) and am glad to hear of this success. Thanks for sharing this important milestone. I read the piece by Olmsted and Blaxill that you linked. It's remarkable! While they admit that "Polio [was] never fully understood even by those who devoted their lives to studying and subduing it," they claim to have reached that understanding after "two years!" It's enough to send into deep depression those scientists who have labored for years without producing publishable results. Olmsted and Blaxill make unimpeachable conclusions from the increase in polio infections during the industrial revolution. This increase could, by no stretch of the imagination, be related to increased population densities resulting from urbanization which accompanied industrialization. That would be utter nonsense. It must be DDT and other unspecified industrial toxins... and... um... arsenic, yeah... that sounds scary enough. Yes, the mind boggles. They started with the conclusion (that polio can't really be so bad, and that vaccines are the real problem) and then cherry-picked facts, mixed the facts with a terrible misunderstanding of science, and voila: pseudoscience. Extensive cherry picking of historical data in the service of correlation as causation.